Do you suffer with arthritis pain? Comfortably exercising in a swimming pool may reduce symptoms of this inflammatory joint condition. According to the Centers for Disease Control, physical activity can reduce pain and improve function, mobility, mood, and quality of life for many with various kinds of arthritis. While physical activity can be beneficial, it can also be painful. Even worse, the wrong workout methods can actually aggravate your condition. That’s why choosing swimming and pool-based exercises are a smart solution in the fitness equation for those with these inflammatory ailments. Aquatic activities can be the answer if you suffer from osteoarthritis, rheumatoid arthritis, fibromyalgia, and lupus. Let’s look at some reasons why. Swimming provides a safe, low-impact cardio routine. Maintaining a healthy weight is critical for those with joint diseases, as extra pounds mean extra work on already-sensitive joints. Along with the right diet, a regular cardio routine helps burn calories—keeping the number on your scale in check. Many land-based cardio exercises, such as dancing or jogging, are tough on the joints. However, swimming and water aerobics are not; they provide low-impact workouts that you can be varied in intensity to benefit your heart and boost your metabolism. Aquatic exercise works muscles with minimal stress on joints and muscles. One dilemma facing those with arthritis is that they need resistance training to strengthen muscles, yet many forms of resistance training put pressure on joints—leading to flare ups. This resulting pain can be immobilizing—making you want to avoid future activity. However, resistance training in a pool is different. When swimming, resistance comes from the water itself, although you can intensify resistance by adding weights and other fitness gear designed for pool use. What really makes the difference is that your body is buoyant in water, weighing up to 90 percent less. That means minimal stress on joints when you are moving around and working your muscles in the pool. Water activities help boost balance and flexibility. Since joints are the area directly affected by arthritis, those who suffer from it can face challenges with physical stability in their limbs, and they can be at greater risk for falls. Swimming allows you to build muscle mass and elongate muscles. Stronger muscles help protect joints, and they also help improve balance. Additionally, if you exercise in a heated spa or whirlpool, the warm water can also help improve your flexibility and range of motion, relieving stiffness caused by arthritis. Hydrotherapy helps to soothe pain. Spending time in your pool can help relieve some of the physical—and emotional—soreness and tension caused by arthritis. Whether you vigorously swim laps or lazily float around the shallow end, simply being in the water reduces the gravity’s pull on your body and allows muscles to relax. If you have a spa, relaxing in warm, bubbling water can provide additional relief; the heated water helps relax and loosen muscle fibers, alleviating sore joints and easing muscle tension. 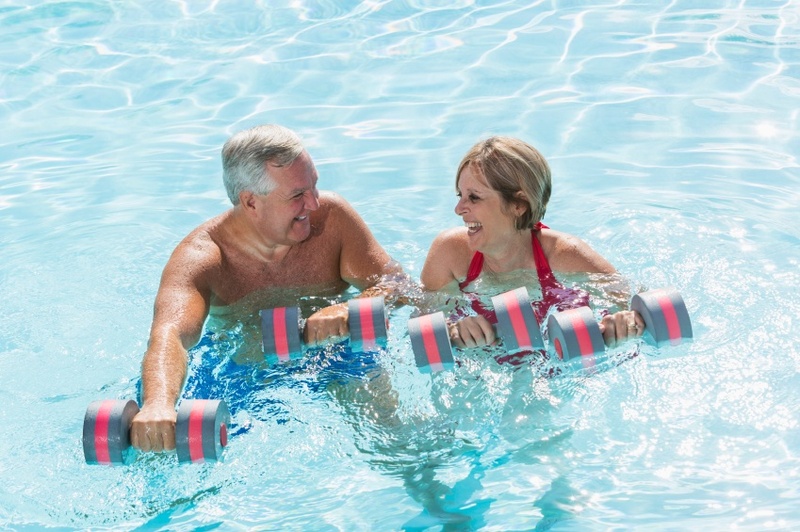 Regardless of your current level of physical fitness, an aquatic-based fitness routine can help combat the symptoms of arthritis and achy joints and muscles. If you have any kind of medical condition, it is particularly important to check with your doctor or physical therapist before starting any kind of fitness regimen. 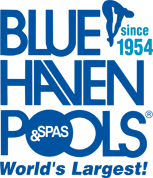 Once you have their approval, go ahead, jump into your pool, and enjoy some healthy, low-impact H2O fitness and hydrotherapy!